The capsules are combined with another enzyme called papain. Papain comes from the papaya fruit and serves naturally as protection from plant pests. Both enzymes are digestive and stimulate the fat metabolism. Pineapple is a plant species of the bromeliads family and has its origin in America. Today, it is planted worldwide in tropical areas as fruit. Bromelia, which finds its application in the nutrition as well as in the food technology, is extracted from the fruit and/or plant. The capsules are combined with another enzyme called papain. Papain comes from the papaya fruit and serves naturally as protection from plant pests. Both enzymes are digestive and stimulate the fat metabolism. The capsules can be taken along very handy in a make-up bag to be taken discretely before meals. 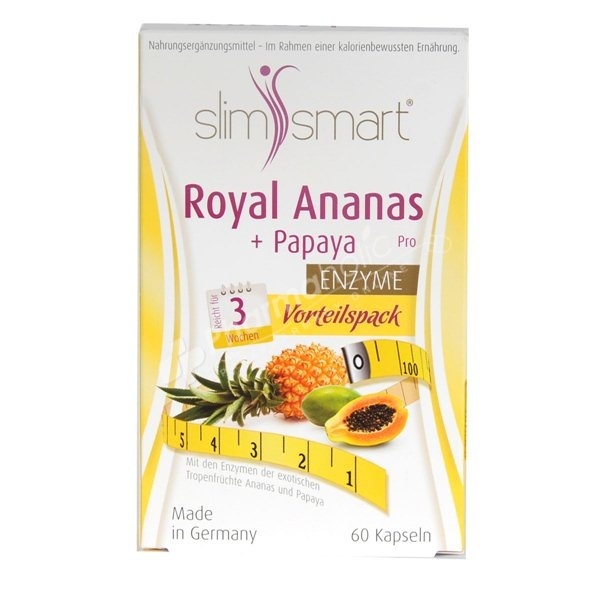 With Slim Smart Royal Pineapple + enzyme capsules you give your body what matters: the precious enzymes from pineapple and papaya. Consuming the capsules before meals can support you in an easy way to burn and get rid of fat faster. Your diet stays balanced and varied – just the way you love it. 3 capsules, swallowed whole, should be taken daily 1 – ½ hour before the meal with a large amount of water or juice. Bromelain 1200 GDU powder (bromelain, carrier: maltodextrin), papain powder 3.0 FIP (papain, carrier lactose), Capsule shell: gelatin, filler: microcrystalline cellulose, releasing agent: magnesium salts of fatty acids Herbal. The recommended portion for daily consumption is not to be exceeded. This product is no replacement for a balanced and varied diet and a healthy way of living. Product is to be kept and stored out of the reach of children.